This morning, my three daughters had Honey Nut Cheerios for breakfast. Today, I’m not going to blog about the male Honey Nut bee or how there are no female mascots at all on children’s cereal boxes– that’s right ZERO– because I’ve done that before. I won’t get into how my husband said, as the girls fought over who got to place the brave adventures of Honey Bee in front of her bowl, that cereal boxes are a kid’s first newspaper. Today, I’m blogging about the coveted prize inside the box. What did my kids get? A stormtrooper pen. So here’s my question for you: If there were no “Star Wars” double trilogy (is there a better word for the length of this epic?) would a kid covet a stormtrooper? If toy makers filled the shelves of Target with these white, faceless figures, would kids want them without Hollywood blockbusters providing a context? The answer is no. To sell a toy, having a story helps a lot. It’s all about the narrative. Next question: Where are the narratives where girls get to be heroes? Where are the narratives, the epic trilogies, the Hollywood blockbusters, where girls get to star? If you think of a female character who is shown, front and center, again and again, who is she? What image comes to mind? Is she, perhaps, a princess? The gendered toys marketed to children are a symptom. The disease is that girls have gone missing from narratives, sidelined and marginalized, in literature, religion, art, and politics, for thousands of years. In 2013, the consistent narrative where girls get to exist is, still, as the princess. Yesterday, when I wrote about Goldie Blox selling stereotypes, people told me, if I don’t want pink and princess I should just go to the “boy” aisle. But the problem with the “boy” aisle is that there no female protagonists to be found there. 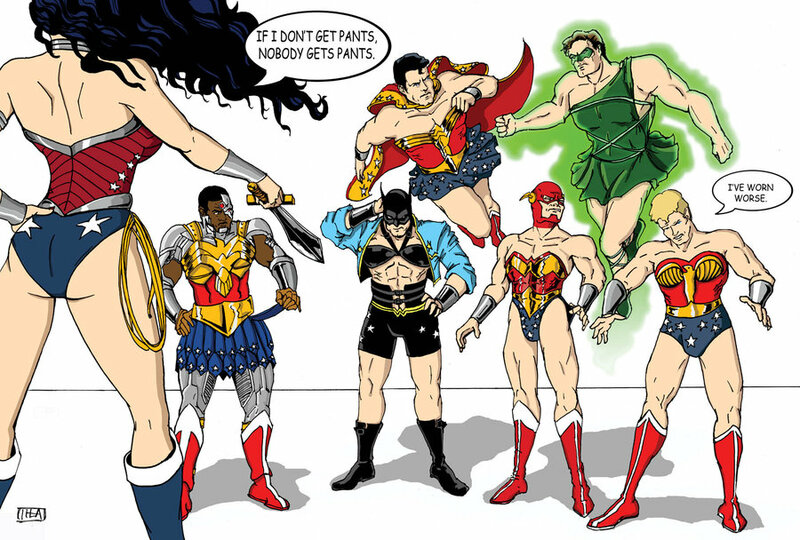 Whether it’s LEGO or a coloring book, whether the product is from the Lord of the Rings, Star Wars, Harry Potter, or the Justice League, female characters are in the minority if they exist at all. My seven year old daughter wanted a LEGO set. We went to three stores, and found no LEGO where girl figures or girls’ stories were the basis of the game except for LEGO Friends, which we found in the “girl” aisle. What epic, magical adventure were these girl figures engaged in? They were at a cafe. My daughter also completed a set where they were at a bakery. I just bought her a third set where the girls are at a high school. My older daughter, after getting frustrated with the LEGO choices, opted for The Hobbit set which includes a male Hobbit, a male wizard, and 5 male dwarfs. No females at all. Toymakers claim when they put “alternative” toys on the shelf, they just don’t sell. This is why I ask: If a stormtrooper had no “Star Wars,” would he exist? Where are the narratives where girls are seen having epic adventures? Until we fix that problem, we’re going to keep seeing gendered aisles at Target. Little LEGO men are harassing me? WTF? As if LEGO, with its idiotic, dumbed down LEGO for girls, its pet-shops and hot tubs, isn’t offensive enough, now this? A worker calling out, “Hey babe!” Are you kidding me? After gathering 55,000 signatures of people disgusted by LEGO’s sexist Friends sets for girls, SPARK representatives finally met with LEGO execs last Friday. First, we want to see more girls and women characters across all LEGO lines. My report to LEGO showed that 86.6% of characters are men, which is a major gender gap, and one reason that girls may no longer feel welcomed by LEGO products. A failure to include better representation of girls and people of color in prominent and non-stereotyped roles makes it harder for kids to see themselves in the product, and less likely to want to play with it. By increasing the number of visible women throughout the product lines, LEGO can more easily welcome girls to the building experience beyond the Friends. Let’s keep an eye out at as new LEGO sets come out on how many females are featured in the sets and how many girls and moms are pictured on boxes and in TV ads. Hopefully LEGO will be making some changes. Great job, SPARK. Thank you for being such a great advocate for girls. Read SPARK’s full report of the meeting with LEGO here. Another social media victory! Thank you to all who spoke out and signed the petition. Here’s to hoping LEGO becomes a leader in inspiring both genders to dream big. After a month and more than 50,000 petition signatures, an open letter, numerous radio shows, TV segments, blog posts, articles, and even YouTube videos about the company, LEGO has decided to listen to girls! On Sunday, February 5, Michael McNally, Brand Relations Director, sent an email to SPARK Movement. SPARK, a girl-fueled movement to end the sexualization of girls, is a coalition of more than 70 organizations and reaches tens of thousands of girls and those who support their healthy development. LEGO has accepted SPARK’s request for a meeting to discuss how they can go back to offering all LEGO toys to both boys and girls and to respect girls’ hunger and desire to play with toys that challenge them creatively and intellectually. We want to correct any misinterpretation that LEGO Friends is our only offering for girls. This is by no means the case. We know that many girls love to build and play with the wide variety of LEGO products already available. LEGO Friends joins this global collection of products as yet another theme option from which parents may choose the best building experience for their child’s skill and interest. We listen very carefully to the opinions and input that people share. We will continue to do so as we develop the LEGO brand to deliver the best experiences with the strongest appeal, and we will review our communications to ensure that we represent LEGO play for all children. We are proud to have developed a collection that is receiving positive feedback and reviews from parents and children who are now trying it at home, and we hope that we will engage even more girls in the skill-developing experience of LEGO play. You’re missing the point. It’s true that Lego Friends is particularly shocking in how it perpetuates gender stereotypes. Still, the problem is not that Friends is the only offering “for girls,” but rather: Why does Lego market so separately to girls at all? Why does Lego picture mostly boys on its boxes, boys in its TV commercials, and boys flying an airplane on its Facebook Welcome page? When you go to Lego’s website, why are categories organized: Trains, Robotics, Buildings, Vehicles etcetera and then Girls? Why does Lego act as if “Girls” are in a separate category than so many other options? That boys are important and central and that girls are secondary and an afterthought? It’s this belief that permits missteps like the creation of the Friends sets. In your statement, you write: ”We know that many girls love to build and play with the wide variety of LEGO products already available.” But then why doesn’t Lego aggressively market all of its sets to all children? In 1981, you did. What happened? Please write your own letter to Lego as well. The petition on Change.org asking Lego to stop selling girls out has over 47,000 signatures. You can sign it here. 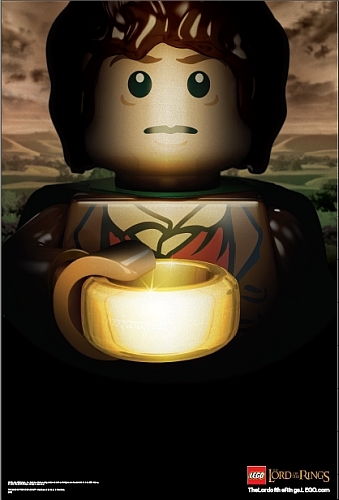 Check out this Lego fig coming out in 2012: Bilbo or Frodo? Lord of the Rings. Hmmm. How many females were in that high grossing, Academy Award winning series? How many males? Check out the link from the Journal Inquirer that pictures Lego’s new toy. It won’t let me copy the photo, but the Legos pictured are so much cooler than the Friends for girls and guess what– all male. Other best-selling Lego sets are based on the Indiana Jones and Star Wars movies. Do you see the sexism chain reaction here? When girl characters are excluded from movies, they’re left out of toys and branding on all kinds of kids clothing and products as well. Please take a look at Reel Girl’s Gallery of Girls Gone Missing from Kids’ Movies in 2011. These movies predominantly star males, feature multiple males in the cast, and have names of males in the movie titles. Whereas in 2010, Disney switched a movie title from “Rapunzel” to “Tangled” just to downplay the female. This kind of blatant sexism repeatedly teaches kids that boys are more important than girls, and that’s a horrible lesson for both genders to learn. Of course The Hobbit was a book long before it was a movie. J.R.R. Tolkien’s classic came out in 1937. But it’s Hollywood’s appropriation of the story that makes it massively popular with a new generation, grounding it in pop culture and inciting the creation of a slew of toys timed to hit stores around the same time the movie hits theaters. Do you think the 2 females listed above will make it into the Lego set? As long as Hollywood keeps girl characters out of its films, it’s going to be challenging to convince toy companies to represent heroic females in their toys. It’s asking them to use a lot more imagination. Of course, toy companies should be imaginative. Isn’t that the point of a toy? Especially a toy company like Lego that claims to be a learning toy “fostering creative play?” But instead, Lego prefers to spend its time and money “researching” the best way to copy Disney. On its Facebook page, Lego keeps responding to hundreds of people upset about the “for girls” sets, that there are many other Legos out there to choose from. But Lego isn’t aggressively marketing those sets to girls. On its own FB welcome page, Lego has two boys pictured flying a Lego airplane. Will Lego be marketing the new “Lord of the Rings” set to girls? How? If you go into any mega chain like Target or Walmart or Pottery Barn, all of them have “boy aisles” and “girl aisles.” The “Lord of the Rings” sets and the other building sets mostly show boys pictured on the boxes and contain multiple male figs inside of those boxes. Where do you think the “Lord of the Rings” set will be? Where will the Kim Kardashian wannabe Friends Lego set be found? How’s a girl going to feel being dragged by her mother into the “boy aisle” where all the photos are telling her she’s in the wrong place? If a highly paid researcher was studying this girl’s behavior, what do you think he would record? Maybe Target should stop with the boy and girl aisles. (The London toy store Hamley’s has done just that, giving up gender segregation for sections on arts and crafts, outdoor toys, building toys, soft toys etc.) Maybe Hollywood should make more movies with multiple girl roles and put females front and center. Maybe parents should demand more of those movies and get upset when girls remain invisible. Hollywood shows our kids animals who talk, rats who cook, toys who come to life, and singing lions who befriend warthogs. Is it too much to ask to see imaginary worlds where girls and boys are treated equally? How long do we have to wait? 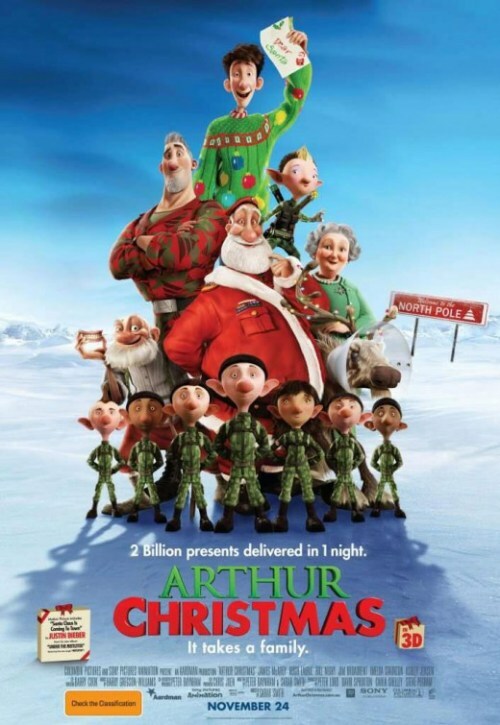 Anyone see “Arthur Christmas” this year?